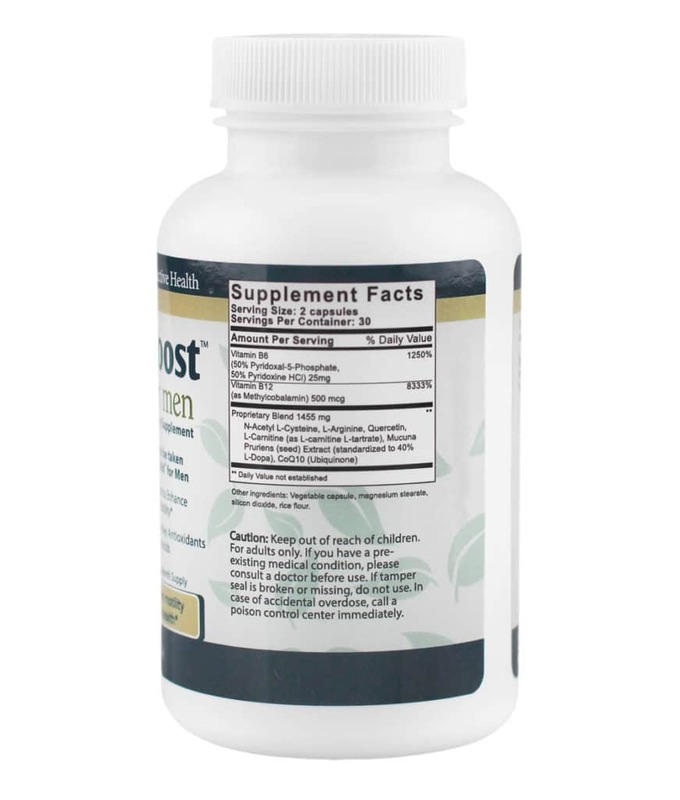 Well, I don’t know if my motility increased, but I took this along with FertilAid (per instructions), and after 6-7 months, we are now pregnant. My urologist told me that the only way for me to have a child is by having a surgery because I have a varicose or my fiancée and I can try IUI or IVF. I did some research on line and came across the Motility Boost and Fertilaid. 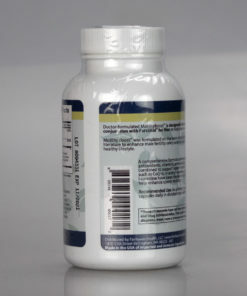 I ordered a bottle and I can testify today that my fiancée is 5 weeks pregnant and I still have some of the capsules left in the bottle. It surely works!!!! Thanks Fairhaven Health. Weve been trying to concieve for 1 year and 5months. My husband had a Vasectomy reversal August 2009 which resulted in a infection. After a strong course of antibiotics he quickly recovered. Im sure due to the infection his sperm count after 3 month was great but quickly dropped to 20%. After a course of Menevit which is a sperm booster his count rose to 50% 🙂 but motility doctors told us we have a 2% chance concieving naturally. 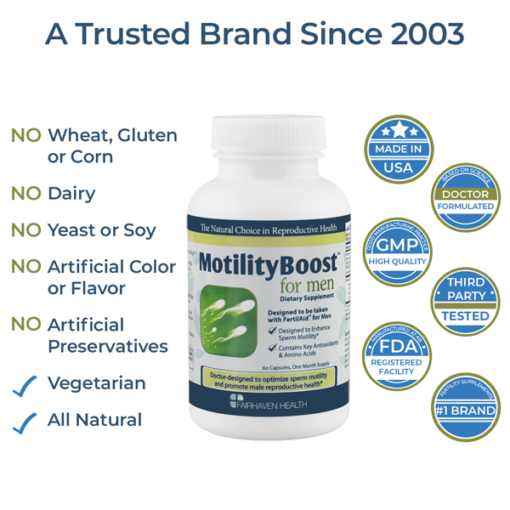 I purchased Motility boost + Fertilaid & my husband has religiously been taking the products for 4 months. We have not had much luck still but will stay posotive & will continue with these products for a few months in hope well concieve naturally! I can´t say for sure if this worked and was the cause, because I havent done a spermogram since then, but I can´t find another explanation for getting pregnant, so I assume this actuallty worked for us. Besides , I was worried about some issues of the formula, they did contact me and tried to explain everything to me, I mean the customer service was really nice. 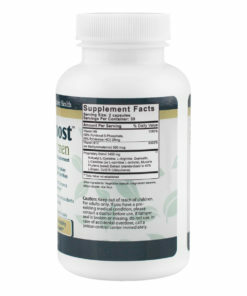 I was taking FertilAid for Women for couple of months, then was starting to get frustrated as I am not getting pregnant and its been a year and 3 mos ive been trying to get pregnant. 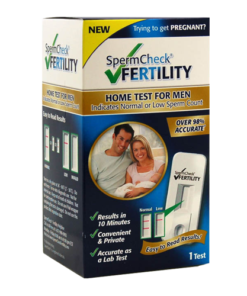 Last September 2011, me and my husband both went for a fertility check up, and was found out that my husband had varicocelle on his left testes affecting his sperm count. After a week, he underwent an operation to correct the problem. But then his doctor wont give him any fertility meds until 3 mos. 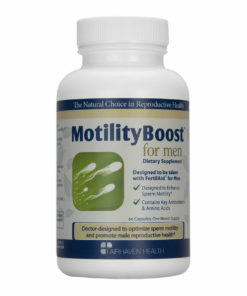 I purchased 1 set of FertilAid, CountBoost and Motility Boost for him as i cant wait for that period. 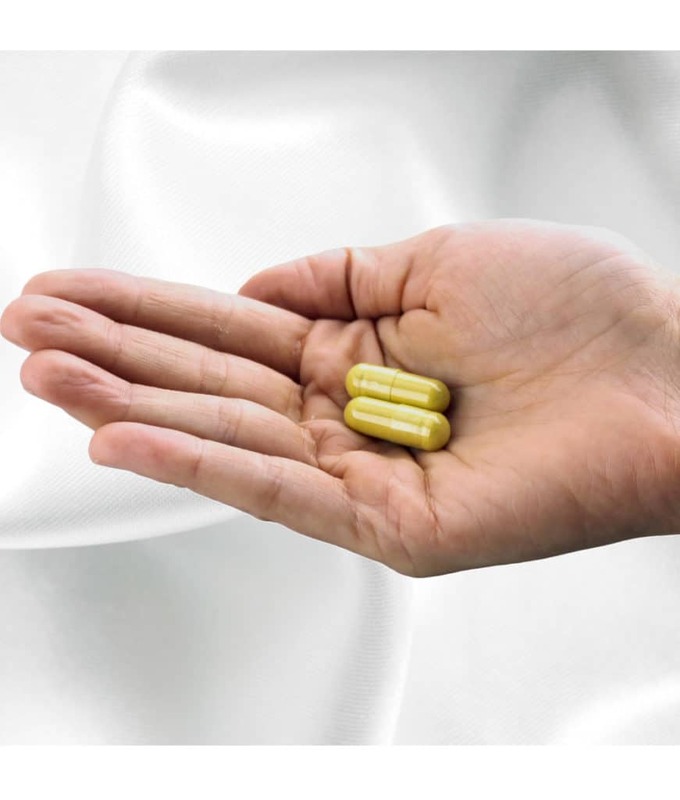 After a month of taking it, his motility increased from 20% to 42% (40% normal range). And now, were so happy to be an expectant dad and mom, as I am almost 2 mos pregnant. 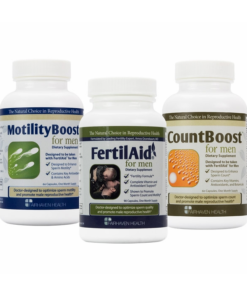 I started my husband on all three of your supplements when his last sperm count after his vasectomy reversal showed less than 5 million, with no motility. Within 6 weeks of starting the supplements we were pregnant. Thanks so very much. This was our last try before attempting in vitro again. Thanks to you we dont have to do invitro anymore…..
My husband noticed a differance. 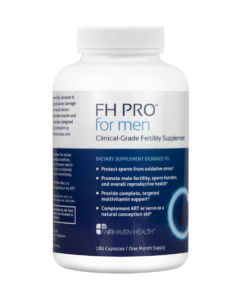 Well my husband took this product and he did notice a differance in his sperm volume. 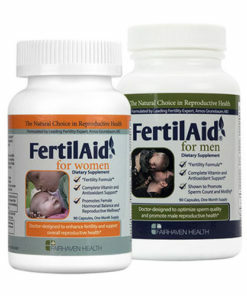 I have ordered FertilAid products twice from your company and have been very please with shipping and the product itself. 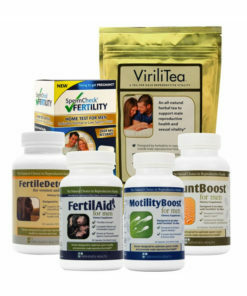 I ordered another 3 month supply of FertilAid for men and woman as well as 3 bottles of Motility Boost for Men at the end of May – and we are happy to say that we recently found out we are expecting a baby and I believe I owe it all to your products! 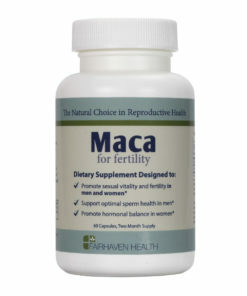 I was taking Fertile CM to increase mucus on my part & it worked very well during my ovulatory phase. I didn’t notice much of a change in my cycle otherwise though. 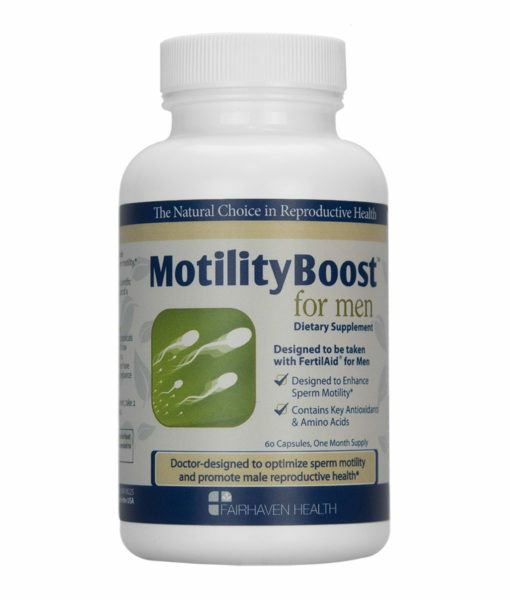 My husband quit chewing tobacco 2 months ago & started taking Motility Boost along with FertilAid for Men. 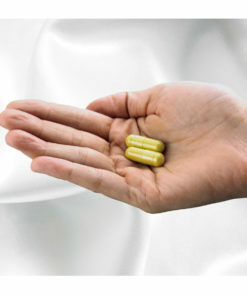 I had been complaining of pelvic pain after ovulation for 2 months. Ultraounds for both months indicated that my dominant follicles had turned into a large cyst on each ovary. I was devastated. But when my period ended up being 10 days late, I took a pregnancy test & it came back positive!! 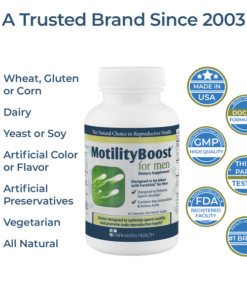 I have no doubt that the combination of products that my husband & I used had a huge impact on being able to conceive, especially the Motility Boost. 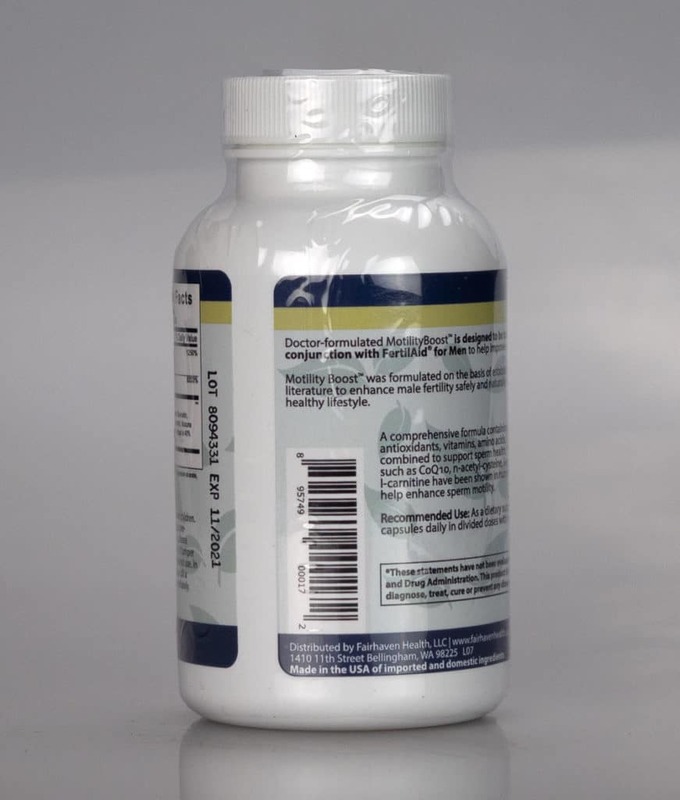 And these products were so much cheaper than the Proxeed that my doctor recommended for my husband’s sperm. BLESS YOU for your products! !